We’ve blogged about the stages of localization maturity and how buyers of foreign language translations could use it as a benchmark. As a buyer of translations, it is easy to get overwhelmed with information, especially at the Reactive Stages. Therefore, we’ve developed a few basic questions that may help to get a conversation started with Language Service Providers (LSPs) when evaluating buying decisions at each level of maturity. Today, we’ll cover the Ad-Hoc stage. The Ad-hoc stage is the first stage of maturity. Organizations at this stage are beginning to respond to international (or domestic foreign language) market demands. Purchasing translation services is a black-box to many. Because buyers cannot evaluate the value points when they purchase translations at this stage, price is the only factor to fall back on when evaluating buying decisions. 1. Why is there a price difference in my quotes and how should I evaluate the price difference? Even at the basic level you should ask critical questions about what is quoted, why you get these services and how it would affect your outcomes. Is translation just based on word count or are there other critical processes that I should keep in mind, such as review and project management. What service level do I expect? What are my timeframe options? How can I be sure that the translation is done by a qualified team and how does the LSP evaluate this? How can I be sure that my project is evaluated and I don’t end up with costly out-of-scope work? 2. What should I expect from my Language Service Provider (LSP) at this stage? Translation could be a long-term commitment. When organizations start to support foreign language speakers with translated content, that creates a commitment. What will your LSP do today to make your project a success and what can you expect when you go back to them for more work? Are LSPs building assets for you like Translation Memory and Glossaries and do they share these with you? Do they care to explain how these assets can help your organization? Are they interested to help you move up the maturity levels; are they knowledgeable about your industry and interested to learn about your organization, goals and objectives? 3. What risks are there to my project’s outcome? At this stage, project outcome is the main concern. Even though the project may seem small, investing your time and effort to do this right at the start can not only bring a positive start in reaching out to your second language audience, it also is a positive start for your organization to start with translation. A display advertisement by McDonald’s went viral. A proof by a Project Manager after this went to layout should have caught that the Hmong translation had no spaces in it. This is a case of a translation company just getting a translation and not even looking at it. No matter how small a project, each communicated piece is a purposeful effort to reach an intended audience. Start a conversation with your LSP about your audience and what your goals and objectives are. Does your LSP ask in-depth questions about that the content in relation to the intended audience and are they able to talk intelligently about the subject? Translation gaffes often involve small things and where risk does not seem to be so apparent. Often, the smaller projects are the most complex projects. The risk of a bad outcome in – for instance – a work safety manual is very apparent. But a seemingly innocent and relatively simple and creative Coca-Cola project with random words ended up in a marketing debacle for this large organization. 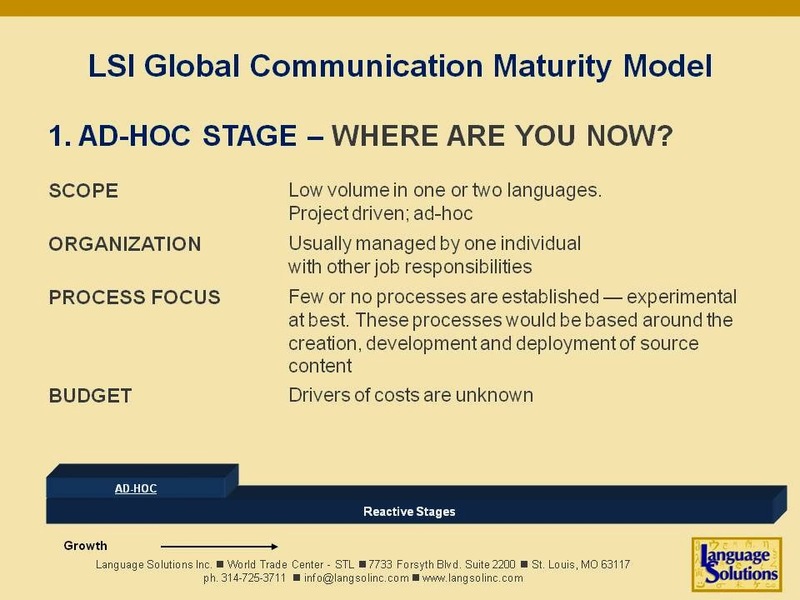 That also brings another point about risk and maturity levels: even large international organizations may not always be a mature buyer of translation services. Even though Coca-Cola has done some very innovative advertising with their name in foreign languages (name and brand = risk) and other work that we have posted on our Facebook page, this effort clearly showed buyer immaturity and lack of project management. Use these 3 questions to discern the value of what you are getting from their translation project and move beyond the price evaluation alone. Understand that even at this stage of maturity, a translation project has value to your audience and your organization. 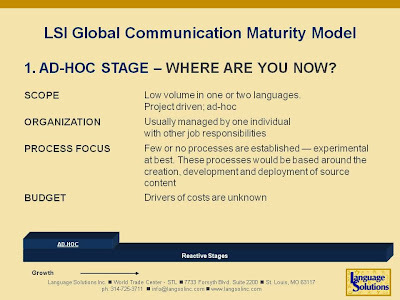 Updated: September, 2016: We have now put our assessment of an organization online so that by answering 5 questions, we will estimate your placement on the Global Communication Maturity Model, identify your risks and show you areas where you can get help. Take our assessment!